Heat oven to 375°F. Cook broccoli as directed on bag; drain well on paper towels. If using crescent rolls: Unroll both cans of dough; do not separate. On ungreased cookie sheet, place dough with long sides together, forming 15x12-inch rectangle. Press edges and perforations to seal. If using dough sheets: Unroll both cans of dough. On ungreased cookie sheet, place dough with long sides together, forming 15x12-inch rectangle. Arrange turkey in 6-inch-wide strip lengthwise down center of dough to within 1 inch of each short side. Spread mustard-mayonnaise spread over turkey. 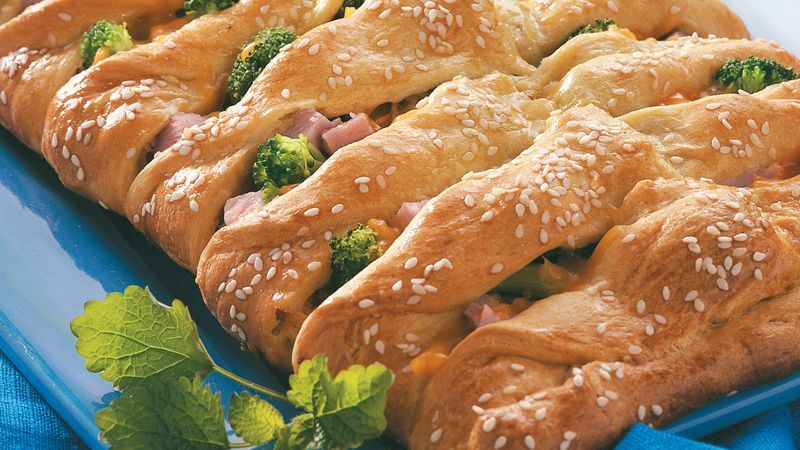 Top with ham, broccoli and cheese. With sharp knife or scissors, make cuts 1 1/2 inches apart on long sides of dough to within 1/2 inch of filling. Alternately cross strips over filling, twisting strips once. Tuck ends under; press to seal. Brush dough with beaten egg. Sprinkle with sesame seed. Bake 35 to 45 minutes or until crust is deep golden brown and no longer doughy, covering with foil during last 10 minutes of baking to prevent excessive browning. Cool 5 minutes. To serve, cut crosswise into slices. For the best results, always keep refrigerated dough very cold until just before you're ready to use it.